The parentheses indicate text that did not pass Soviet censors for military security or propaganda reasons. President Roosevelt's special envoy to Russia, former ambassador Joseph Davies, is expected to arrive in Moscow either today or tomorrow. Mr. Davies reached Kuybyshev last night. As yet there has been no definite information here as to the purpose of his visit. The only thing we in Moscow know about the Davies mission is that he did not travel all this way merely for the ride. The Soviet-German front was comparatively quiet again last night. Down in the Kuban, the Nazi forces have attempted a series of counterattacks but thus far have failed to pull off anything that even looks like an offensive. Front dispatches say that these German counterattacks, however, are being made with ever increasing forces—both on the sector northeast of Novorossiysk and in the Lower Kuban river area. At Lysychansk, at the eastern end of the Donets river line, the Red Army is digging in after crossing the river and capturing important defensive positions. Another of those warnings to the Red Army and the Russian people about the pending summer fighting appears again in today's Red Star. It's about the sixth such warning to be published in the Soviet press in the past ten days. The newspaper says "the thunder of battles will be roaring soon which will require the greatest courage and energy from the Red Army. We still have to shed no small quantity of blood in order to rout the Hitlerians . . . Not one inch of native soil must be given to the enemy if he attempts to attack. Every village and house must become a fortress and bastion of defense . . ."
This is the kind of talk we heard during the early days of the war and during the defense of Stalingrad. These warnings are designed to make the entire nation conscious of the situation at the front—a situation which, because of military security, cannot be described in detail. However, it is well to note that these press warnings make no mention of plans for the Red Army. While it is necessary to warn people of possible military action by the enemy, the home front does not need to be told of offensive action by their own forces. So in considering the situation on the Russian front, you must also consider the possibilities of a Red Army offensive. Such a move by the Russians is not ruled out. However, the tone of the official press the past two weeks has given absolutely no hint that such an offensive is developing. This is Bill Downs returning you now to CBS in New York. The 82nd Airborne Division's assault on the Waal river crossing at the Dutch city of Nijmegen during Operation Market Garden was one of the most brutal battles of the Allied advance to the Rhine. The attack was nicknamed "Little Omaha" because of the heavy losses on both sides. As an eyewitness, Bill Downs described the assault as "a single, isolated battle that ranks in magnificence and courage with Guam, Tarawa, Omaha Beach. A story that should be told to the blowing of bugles and the beating of drums for the men whose bravery made the capture of this crossing over the Waal possible." He recounted, "The Nijmegen Bridge was in our hands intact as a monument to the gallantry of the 82nd Airborne soldiers, those who crossed the river, those who stormed it from the south." 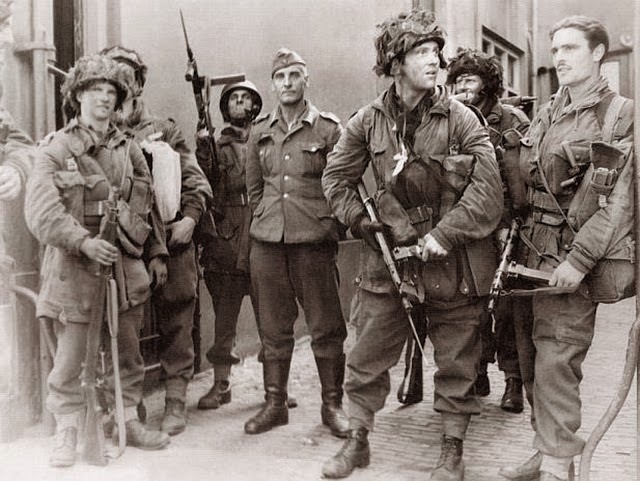 "American airborne patrols reached the area at the southern end of the bridge on Sunday night, September 17th, shortly after they landed, but at that time they were not in enough strength to do anything about it. On Monday the paratroops and glider forces were too busy beating off the German counter-attacks to coordinate an assault on the bridge. By this time the armour of the British Second Army was on its way northwards from the Escaut Canal. 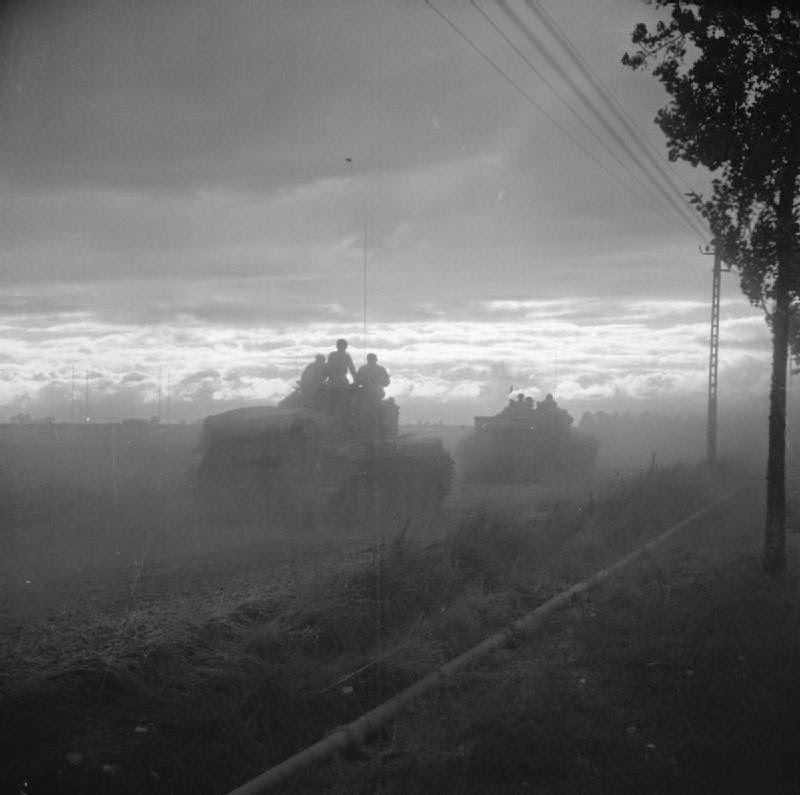 Then on Tuesday the British tanks arrived on the outskirts of Nijmegen and an attack was commenced, but still the Germans held on strongly in the fortification and houses on the south end of the bridge. American airborne infantry and British tanks were only 300 yards from the bridge in the streets of Nijmegen, but they couldn't get to it. "Tuesday night was the strangest. The American troops took machine guns to the top of the houses and sprayed the approaches and the entrance to the bridges with bullets. All night they shot at anything that moved. Perhaps it was this constant fire that kept the Germans from blowing the bridge then. But still the shuddering blast that would signal the end of the bridge did not come. And when morning arrived a new plan was devised. It was dangerous and daring and risky. The commanders who laid it out knew this; and the men who were to carry it out knew it too. Thinking a frontal assault on the bridge from the south was impossible, American infantry were to fight their way westwards down the west bank of the Waal River and cross in broad daylight to fight their way back up the river bank, and attack the bridge from the north. On Wednesday morning the infantry made their way westward through the town and got to the industrial outskirts along the river bank near the mouth of a big canal. Some British tanks went with them to give them protection in the street fighting and to act as artillery when the crossings were to be made. Accompanying this task force were trucks carrying twenty-six assault boats brought along by the British armoured units in case of such an emergency. Most of the men who were there to make the crossing had never handled an assault boat before. There was a lot of argument as to who would handle the paddles and preference was given to the men who had at least rowed a boat. Everything was going well. The Germans were supposed to be completely surprised by the audacity of the move. "But late in the morning—the impossible happened. Two men showed themselves on a river bank and were fired at by the enemy. No Americans were supposed to be in that part of the town. The 88-mm. shells began plastering the area. The gaff was blown. Reconnaissance spotted batches of German troops being transferred to the opposite bank. A few hours later, machine guns were dug into the marshes on the far side—the plan had been discovered. The task force was under shell-fire, and several hundred Germans with machine guns were sitting on the opposite bank waiting for the crossing. This was about noon. There was a quick conference. It was decided that the original plan would proceed, but this time the men crossing the river would have the help of heavy bombers—Lancasters and Stirlings flying in daylight to drop their bombs on the opposite bank in tactical support of the men from the assault boats. "Working under enemy shell-fire, the assault boats were assembled. When they were put into the water, another difficulty arose. The tide was moving, but with a downstream current of eight miles an hour. Some of the boats drifted 300 yards down river before they were retrieved and brought back. Meanwhile machine guns spluttered on the opposite bank and German artillery kept smashing the embarkation area regularly. "At last everything was ready. The bombers went in, but didn't drop their bombs close enough to knock out the machine guns. Twenty-six assault boats were in the water. They would carry ten men each. Two hundred and sixty men would make the first assault. Waiting for them on the other bank were some 400 to 600 Germans. The shelling continued. Every man took a deep breath and climbed in. Someone made a wisecrack about the airborne navy and someone else said they preferred airborne submarines to this job. And off across the river they started. At the same time behind them, the British tanks fired their heavy guns, and our own heavy machine-guns fired into the opposite bank giving the little fleet as much cover as possible. "And over on the other side of the river the enemy tracers shrieked at the boats. The fire at first was erratic, but as the boats approached the northern bank the tracers began to spread on to the boats. Men slumped in their seats—other men could be seen shifting a body to take over the paddling. One man rose up in his seat and fell overboard. There was no thought of turning back. The paddling continued clumsily and erratically, but it continued. One of the boats had so many holes in it that the men were baling out with their tin helmets—it was almost splintered when it reached the other side. "The fighting, though, had only just begun. The hundred or so men who had arrived on the opposite side fought their way forward with the bayonet and grenade, going from one machine-gun nest to the other until they had established a bridgehead only a few yards deep and several hundred feet wide. The thirteen boats had hardly left for the return trip for the reinforcements, when the men on the north bank saw specks in the water. The men on the opposite bank, seeing the casualties suffered in the landing under fire, were not waiting for the boats. Some of them had stripped off their equipment, and taking a bandolier of ammunition, were swimming the river with their rifles on their backs. And thus it went—the thirteen little boats going time after time across the river under fire, the men on the bridgehead digging in and firing as rapidly as possible, routing out the German machine-gun nests by hand, while British tanks fired for all they were worth. After an hour and a half of concentrated hell, the infantry were over. They held a bridgehead several hundred yards wide and 100 yards deep. After that time, one officer counted 138 Germans dead in a space of sixty yards of that bloody beach-head. "There was a welcome pause as the men consolidated and rested in their foxholes. Some had thrown the German bodies out of the Nazi machine-gun nests and were using these to stiffen their defences. The plan was to turn eastwards and assault the northern end of the bridge. But on the left flank of that minute bridgehead was another menace—for there on the high ground overlooking the bridge and firing at us with some 88 guns, was an ancient fort. It is called Hatz van Holland and was supposed to have been used centuries ago by Charlemagne as a fortress. The Germans had been using the fort as an anti-aircraft gun position to defend Nijmegen, and now they turned the ack-ack guns downward to bear on the bridge and the airborne bridgehead. While these guns were firing at the back, the troops could not fight their way to the northern end of the bridge. A detail was formed to attack the Hatz van Holland and put its guns out of action. That, as warriors centuries ago found out, was extremely difficult because the Hatz van Holland was surrounded by a moat. "This moat had a few feet of water in it—black dirty water, covered with a layer of bright green slime. Also, the attacking party would have to advance under point blank 88 mm. fire. But anyhow the party set out. They crawled towards the high ground and the 88's banged away at them. And then they came to a zone where there were no 88 shells. It was found out that the other 88 guns were so installed that the guns could not reach downward the far. The German gun-crews discovered this too late and rushed to put up a rifle and machine-gun defence along the moat. But the Americans by this time had faced so much that a few machine guns were nothing. They made a stand-up attack, shouting like Indians, and, with tommy-guns blazing, knocked out the historic Hatz von Holland. A few Americans with blood in their eyes left seventy-five Germans dead in that moat. The remaining troops fought their way up the river all right. they captured the northern end of the railroad bridge and worked their way to the junction of the railroad highway from the main bridge. The entire German position on the northern side of the river was cut off." American Airborne infantry and British tanks beleaguered the streets of Nijmegen only 300 yards from the bridge that night, but they couldn't get it. A daring plan was drawn up. Wednesday morning, the infantry (504th) made its way to the industrial outskirts along the river bank. 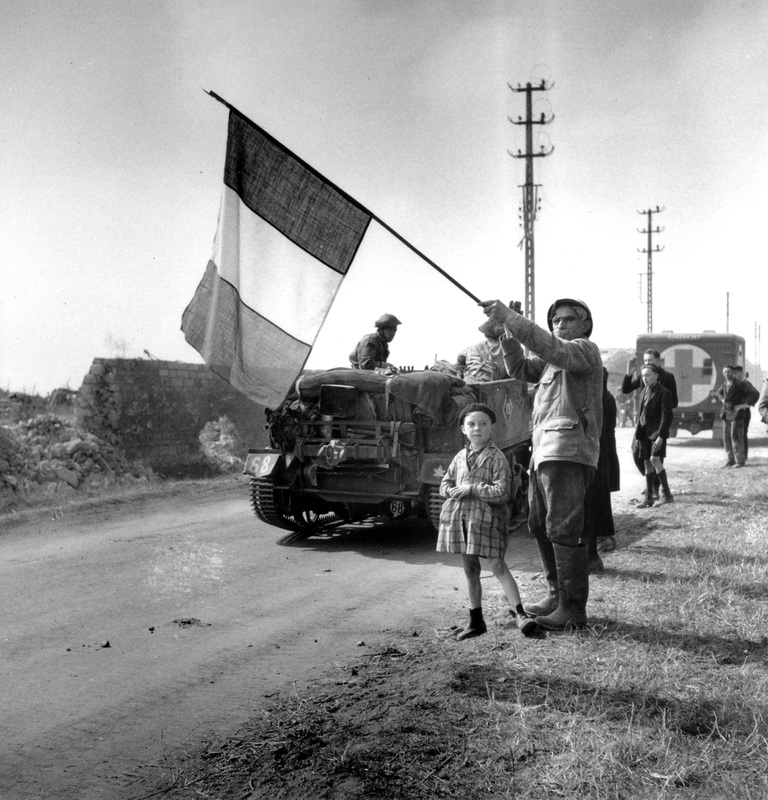 British tanks protected troopers in street fighting, acted as artillery when the crossings were made. Twenty-six assault boats were in the water. Two hundred and sixty men would make the first assault. Waiting for them on the other bank were 400 to 600 Germans; the shelling continued. A smoke screen was laid, but it wasn't very effective because of the wind. Men slumped in their seats; of those 260 men, half were wounded or killed. Only 13 of 26 boats came back—others didn't wait for boats. Some stripped off equipment, took a bandolier of ammunition and swam the river, rifles on their backs. There was bitter bayonet fighting and Americans died, but more Germans died. That's only part of the story...British tanks and American Airborne Infantry (2nd Bn., 505th) began their frontal assault on the southern end of the bridge at the same time as the river crossing was started. Americans went through the houses on either side of the street. The southern end of the bridge has a large circular island approach. In this island were four self-propelled guns. There was nothing to do but rush the guns. So the tanks lined up four abreast and all roared into the street, firing. 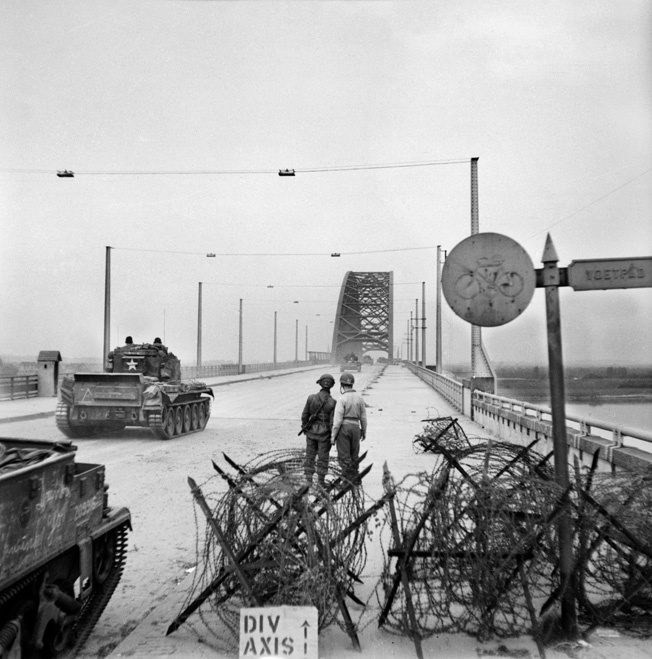 The American Airborne troops and British tankmen seized the south end of the bridge. Only tanks could get across at first because half a dozen fanatical Germans remained high in the girders, sniping. The Nijmegen Bridge was in our hands intact as a monument to the gallantry of the 82nd Airborne soldiers, those who crossed the river, those who stormed it from the south. This article is part of a series of posts on how The New York Times covered the rise and fall of fascism. In 1924, Benito Mussolini spoke with a Times correspondent about opposition to fascism in Italy. He denied involvement in the assassination of Giacomo Matteotti, a socialist politician who ran against Mussolini in the 1924 election as part of the Unitary Socialist Party. Matteotti had been murdered by fascists after questioning the election's legitimacy. ROME, Oct. 12 — On his return from a triumphal tour of northern Italy through which the populations of every place he has visited greeted him with an enthusiasm bordering on delirium, Premier Mussolini received The New York Times correspondent today and made important statements about Italy's internal situation after the resolution passed by the Leghorn Liberal Congress, which has been universally interpreted as a stinging condemnation of Fascism. Utter disregard of the opinions of the Liberals and determination to continue—alone if necessary—along the road toward the goal which Fascism has set for itself were the keynote of Signor Mussolini's declarations. "The resolutions of the Leghorn Liberal Congress," he said, "which clearly reveal the anti-Fascist sentiment which animates about two-thirds of the Liberals, leave me quite cold and unaffected. I have just returned from a tour of northern Italy, where I have come into contact with the naked soul of the Italian people, of the true Italian people, of the humble Italian people who work and sweat and slave in silence for their country. "With all due modesty I must confess that I have no word to express how moved I am by the truly wonderful reception they accorded me. Why, then, should I worry about a bare score thousand of those whom I have already described as 'melancholy zealots of super-constitutionalism'? Why should I worry about the decisions of a party which in the whole of Italy hardly counts as many supporters as I have in certain single cities? "The large majority of the country is behind me and my Government and I can today repeat what I have always declared, namely, that I neither seek nor refuse help from anyone. "The work of reconstructing my country has only just begun, but it has already borne wonderful fruits. We will continue on our way without looking either to the right or left, always willing to accept the collaboration of any one who offers it in good faith and with the supreme interest of the country before his eyes, but also equally ready to march toward our goal as one. "If the Liberals or any other party care to support us they are welcome. If they do not care to do so we can easily dispense with their services. We have the ability, strength and determination to carry on by ourselves and are ready to do so as long as the bulk of the country stands behind us, as it does at present. Our glory in the end will be all the greater. "The resolution passed by the Liberals in Leghorn is not in itself anti-Fascist and most of its dictates might be accepted by us. 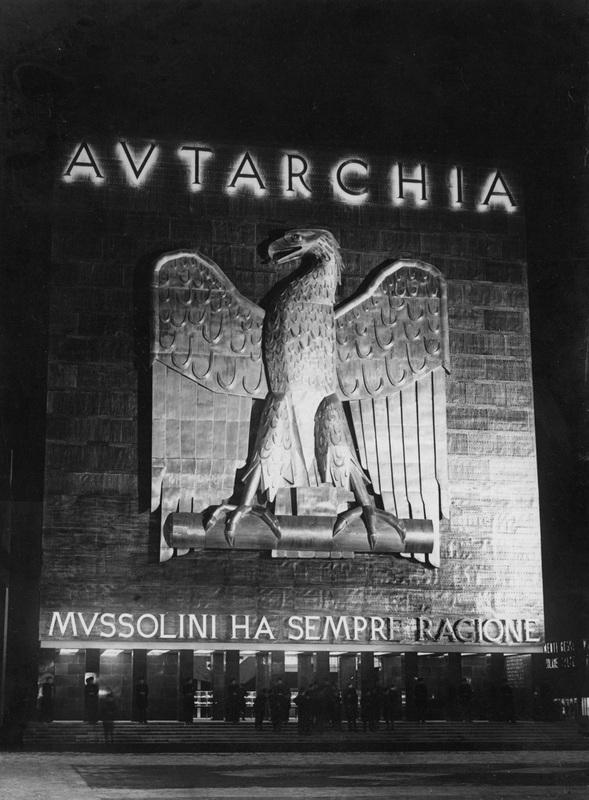 What gives it its flavor of opposition is that it was preceded by violent speeches against the Fascist régime; that orators who tried to stick up for the Government were booed and hissed and that it does not contain a single word of recognition for what we have accomplished for Italy. "We have undoubtedly made mistakes—every human being makes mistakes and I lay no claim to being a worker of miracles—but we have also accomplished much and it would have been only right for the Liberals to have acknowledged it. If, however, the Leghorn Congress accurately reflects the state of mind of the Liberals I am only sorry that they did not vote a resolution of clear cut opposition to my Government. Avowed enemies are always better than insidious friends." As he said these words, which were spoken with great vehemence, Premier Mussolini abandoned himself to one of his rare gestures and pounded the table with his clenched fist. Turning his attention to the internal political situation in general the Premier said that the improvement in the last few weeks had been so great that it could not have escaped even the most superficial observer. "By this I do not mean to imply," he continued, "that it ever presented any real dangers, but there is no doubt that the gradual breaking down of the tissue of falsehoods that the Opposition press had woven around the work and intentions of my government has again raised us in public estimation to the place we occupied before the most deplorable Matteotti murder. "The failure of the Opposition's shameless campaigning of lies and misrepresentations has strengthened the faith of those who never wavered in their allegiance to our régime. It has made fervent Fascisti of many who before supported us only half heartedly, and is attracting to our banners a steady stream of recruits who see in Fascism the only organization capable of giving their country peace, prosperity and happiness. "Facts speak louder than words. This is a law from which the Opposition, try as it may, cannot escape. It may criticise this or that detail of our work, it may heap fraudulent evidence of our supposed misgovernment, but the facts are still there to give them the lie. The country knows that it is more prosperous than it ever was before. It feels the blood of the new life we have infused into it pulsing in its veins. It senses by a kind of instinct that we love our country better than our very lives and therefore is unwavering in its support despite anything the Opposition may do or say. "Every accusation that the Opposition has brought against us has failed in almost miserable fashion. It first sought to prove complicity of the Government in the Matteotti murder, but that is a story which is now received with derision whenever it is repeated. Then it attempted to bring charges of graft and persecution against some of my collaborators, but the objects of its attacks promptly sued for libel and the accusations were withdrawn. Then it tried to show that the reforms introduced by my Cabinet were stupid and contrary to the best interests of Italy; but nobody listened because the increased prosperity and contentment of the country proves the contrary. "All the Opposition's other attempts having failed, it has now entrenched itself behind two words, one of which is new-fashioned and ugly and the other is old-fashioned and beautiful. I refer to the words 'normalization' and 'liberty.' I have never been able to understand what normalization means, nor has any one succeeded in explaining it to me. It would appear to mean 'a return to normal conditions,' but I ask you to what normal conditions? "As for liberty, I think liberty is a fine thing, but it does not mean anything in the abstract, or rather it only means something if it is coupled with work and duty. The greatest trouble with the world as present is that men are too inclined to think of their rights and to forget their duties. I believe that every one must be free to do anything he pleases, but only on condition that he remembers his duty is not to break the laws, not to make himself a nuisance, not to offend public morals, &c.
"In the same way every one must be free to think and say anything he pleases, but only if he fully understands his duty is not to libel his fellow-citizens, not to foment revolution, not to wound the religious susceptibilities of the country, &c.
"With this limitation, I believe every one should have the fullest liberty; but all the same, I believe that duties are more important than rights." Asked on what grounds the Opposition accused him of suppressing personal liberty in Italy, the Premier replied that most of such charges were based on the decree regulating the activities of the press. "But they forget," he added, "that the press had forfeited its right to complete liberty because it forgot its first duty—namely, to tell the truth to the best of its ability." He thought, however, that the press in Italy even now had more freedom than in any other civilized country. "I can state without any fear of contradiction," he said, "that if any paper in America printed even only a small part of what some Opposition papers are printing in Italy, it would have been bankrupt long ago by libel actions brought against it. I am an old newspaper man myself and I know. "I admit, however, that the decree on the press has not worked well in practice, because by taking the control of the press out of the hands of the Magistrates and placing it in the hands of the political authorities it gave the Government the appearance of persecuting the Opposition press, even when its intervention was more than justified. Parliament, however, as soon as it reassembles will discuss more permanent and juridical measures for controlling the press." "I have nothing to say about that most deplorable affair, as the whole matter is in the hands of the judicial authorities, who, I know, will throw full light upon the matter. I wish to express my indignation, however, at the brutal way in which my dear friend and upright, faithful follower Casalini was suppressed. "He filled many important posts in our organization, but was completely penniless when he died and totally dependent on the slender salary he received as a Vice President of Fascist corporations. He was one of the purest Fascisti, one of our most retiring and hardest workers, who had dedicated his life to the elevation of the lower classes. That is why his loss hurts so much. He went privately to see that they were properly looked after. "Nor have I anything to say about Deputy Matteotti's murder and for identical reasons. I wish to state, however, that full light will be thrown on this affair also, no matter who may be implicated, and that the trial will be a great victory for Fascism. "Despite the machinations of our enemies, despite the venomous campaign of the Opposition press, despite the platonic resolution of the Liberals, despite everything, Fascism is forging and will continue to forge its way ahead to ever more luminous destinies. "In the last few days I have approved the plans for the erection in Rome of the 'Mole Littoria,' the greatest building in the world. It will be a tangible, immortal monument to Fascism, which even if the latter were to disappear today—which it will not—would leave its indelible mark upon Italy and perhaps upon the world." On November 25, 1969, CBS President Frank Stanton gave a speech to the International Radio and Television Society responding to Vice President Spiro Agnew's attacks on the news media after Nixon delivered his "silent majority" speech. Agnew accused reporters on major television networks of bias against the Nixon administration, and attacked television news in general. The text below is adapted from a transcript here. I am not here to defend broadcast journalism as being beyond all criticism. No one could have worked as long as I have in radio and television without realizing that we are far from perfect in carrying out our enormous responsibilities in broadcast journalism. We have never been satisfied with the job we are doing. We are not satisfied now. It is our continuing hope and our continuing effort to do better. We are concerned with what the press says of us. We are concerned with what our audiences write us. We are concerned with what our affiliates tell us. We do strive for objectivity, although it is not always easy to achieve. While freedom of the press is meaningless without the freedom to be wrong, we do try to be right. And I think that in the vast majority of cases we have succeeded. Let me turn now to the events of the past few weeks that have commanded the attention of many of us. On November 3, the President of the United States delivered a much-publicized and eagerly awaited speech presenting the Administration's position and plans on the war in Vietnam. That war has been the subject of one of the longest and most fervent public debates in all American history. Good, conscionable and dedicated men and women, from all sections of our society, have earnest and deeply felt differences as to its meaning, its conduct and its prospects. Fundamental questions of rightness and wrongness have disturbed our people as no other issue has in this century. The President spoke for 32 minutes on all four nationwide television networks, four nationwide radio networks and scores of independent stations. Some 88 million people heard his words as they were conveyed, uninterrupted and in a place and under conditions of his own choosing. Following the President's address, each of the television networks provided comments by professionals analyzing the content of the speech. Participating were experienced newsmen, most of whom have performed similar functions for many years following the live broadcast of special events of outstanding significance. Since the participants were different on the four television networks, the comments of none of them were heard by the same huge audience that heard the President. One of the networks added to the expertise by presenting the views of a distinguished diplomat and public servant, who had held high posts in nine Presidential terms, of both parties, prior to the present Administration. Another presented the comments of two United States senators, who took divergent views of the policy advocated in the speech. In all this, nothing unprecedented had happened. Such comments have customarily been offered after most significant Presidential appearances—State of the Union, Inaugurals, United Nations addresses, press conferences, for example. And they usually have been more than mere bland recapitulations, which would serve little purpose, and have frequently called attention to emphases, omissions, unexpected matters of substance, long anticipated attitudes, changes of views, methods of advocacy or any other aspect of the speech. Such comments have been offered by enterprising news organizations since the dawn of the modern press and continued into the era of radio and television. Following the President's speech and following the relatively brief comments made directly after it, the White House was deluged with telegrams and letters approving the President's speech, the White House reported, by an overwhelming margin. Two days later, the Gallup Survey reported that nearly 4 out of every 5 of those who heard it, approved the President's speech and the course that it advocated with regard to Vietnam. Ten days after the President's speech, the second highest official in the Administration launched an attack on the television networks on the grounds that critical comments on government policy as enunciated in a Presidential address might unduly influence the American people—even though, following such comments, the President received a 77 percent vote of confidence from those who heard him on the issue discussed. The Vice President also censured television network news for covering events and personalities that are jolting to many of us but that nevertheless document the kind of polarized society—not just here but throughout the world, whether or not there is television and whether it is controlled or free—in which, for better or worse, we are living. It is not a consensus society. It is a questioning, searching society—unsure, groping, running to extremes, abrasive, often violent even in its reactions to the violence of others. Students and faculties are challenging time-honored traditions in the universities. Young clergy are challenging ancient practices and even dogma of the churches. Labor union members are challenging their leaderships. Scientists, artists, businessmen, politicians—all are drawn into the fray. Frequently, because everyone is clamoring for attention, views are set forth in extreme terms. As we do not propose to leave unreported the voice of the Vice President, we cannot in good conscience leave unreported any other significant voice or happening—whether or not it supports government policy, whether or not it conforms with our own views, whether or not it disturbs the persuasions of any political party or bloc. But no healthy society and no governing authorities worth their salt have to fear the reporting of dissenting or even of hostile voices. What a healthy society and a self-respecting government do have to fear—at the price of their vitality if not of their life—is the suppression of such reporting. To strengthen the delusion that, as a news medium, television is plunging the nation into collapse and can be deterred only by suppressing criticisms and by either withholding bad news or contriving a formula to balance it with good news, the Vice President's speech was replete with misinformation, inaccuracies and contradictions. To deal adequately with all of these on this occasion would take us through the afternoon, but let me note some of them by way of example, then move on to consider with you the context of the Vice President's speech so far as the actions and statements of other Administration officials are concerned and, finally, make some observations on the significance of this unhappy affair. The Vice President began his indictment of November 13 with a monstrous contradiction. He asserted flatly that "no medium has a more profound influence over public opinion" than television. And yet he also claimed that the views of America have been very little affected by this "profound influence," when he said, "The views of the majority of this fraternity [i.e., television network news executives and editors] do not—and I repeat, not—represent the views of America." The Vice President can't have it both ways. If the views of the American people show "a great gulf" between how a speech is received by them and how it is treated in a broadcast, obviously the treatment of it has no material effect upon their opinion. Even the premise of the Vice President's claim is proved wrong by the Gallup findings already mentioned. The Vice President objected to the subjection of the words and policies of the President to "instant analysis and querulous criticism." The analysis, whatever its merits or failings, was hardly instant. Highly informed speculation about the content of the speech had gone on for days and even weeks. Copies were made available at least two hours in advance of the analysis, allowing at least as much time as most morning newspapers had before press time. If a professional reporter could not arrive at some meaningful observations under those circumstances, we would question his competence. The Vice President took care—and the point should not be lost on us—to remind us that television is "enjoying a monopoly sanctioned and licensed by government." A monopoly, by any definition I know, is the exclusive control of a product or a service by a single entity. Television news is broadcast in this country by four networks, all with different and fiercely competitive managements, producers, editors and reporters, involving hundreds of strongly individualistic people; by a dozen station groups, initiating and producing their own news broadcasts, and by hundreds of stations, producing their own news broadcasts wholly independent and distinct from those of any network they may otherwise be associated with. Moreover, it is estimated that, on the average day, 65 percent more hours of viewing are devoted to station-originated news broadcasts than to network news broadcasts. In addition, there are 6,717 radio stations in this country—the overwhelming majority without network affiliations. All this hardly represents monopolistic control. The Vice President seems to maintain that the First Amendment applies differently to NBC from what it does to The New York Times, because NBC's audience is bigger and because television has more impact. That the First Amendment is quantitative in its applicability is a chilling innovation from a responsible officer of the government. By this standard, the Times is less entitled to the protection of the Bill of Rights than the Des Moines Register, with a third of its circulation, and twice as entitled to it as the New York Daily News, which has double the Times' circulation. As for the impact of the television medium, it may be true that combined picture and voice give television a special force. On the other hand, print can be reread, it can be lingered over, it can be spread around, it can be consulted over and over again. Should, on the grounds of these advantages over television, the print media have less freedom? The Vice President asked how many "marches and demonstrations" there would be if there were no television cameras. An elementary textbook in American history might prove instructive. There was no television to record the demonstrations against slavery; demonstrations against the Mexican War; demonstrations against the Civil War draft; demonstrations for women's suffrage; demonstrations for Prohibition; demonstrations for the League of Nations; demonstrations against child labor; demonstrations for economic justice. That there would be no disturbing news except for television is a canard as dangerous as it is egregious. Now let us turn to the crucial issue raised by the Vice President. Despite his complaints about how and what we report, the Vice President protested that he was not advocating censorship. He found it necessary, a week later, to repeat his protest three times in one paragraph. It is far more shocking to me that the utterances of the second-ranking official of the United States government require such repeated assurances that he had in mind no violation of the Constitution than it is comforting to have them at all. Of course, neither he nor any of his associates are advocating censorship—which would never survive judicial scrutiny. But it does not take overt censorship to cripple the free flow of ideas. Was the Vice President's reference to television's being "sanctioned and licensed by government" accidental and devoid of any point or meaning? Was his suggestion that "it is time that the networks were made [emphasis added] more responsive to the views of the nation" merely sloppy semantics and devoid of any notion of coercion? Perhaps the Vice President, in his November 20 follow-up speech, was not referring to government action, but only to a dialogue among citizens when he said, "When they [network commentators and some gentlemen of The New York Times] go beyond fair comment and criticism they will be called upon to defend their statements and their positions just as we must defend ours. And when their criticism becomes excessive or unjust, we shall invite them down from their ivory towers to enjoy the rough and tumble of public debate." Who, in those sentences, will do the calling of these men to defend themselves, and before whom? Who is the "we" who shall do the inviting? And by whose standards will the limits of "fair comment" and "just criticism" be judged and who shall be the judges? The ominous character of the Vice President's attack derives directly from the fact that it is made upon the journalism of a medium licensed by the government of which he is a high-ranking officer. This is a new relationship in government-press relations. From George Washington on, every Administration has had disputes with the press, but the First Amendment assured the press that such disputes were between equals, with the press beyond the reach of the government. This all-important fact of the licensing power of life and death over the broadcast press brings an implicit threat to a government official's attacks on it, whether or not that is the intention and whether or not the official says he is speaking only as an individual. Herbert G. Klein, the Administration's Director of Communications, revealed that, on November 4, the day after the President's speech, calls from White House offices went out to broadcast stations asking whether editorials were planned and, in Mr. Klein's words, "to ask them what they would say in their editorial comment." In Washington, D. C., television stations were called by a member of the Subversive Activities Control Board, Paul O'Neill, requesting logs of news coverage devoted to support of and in opposition to the Administration's Vietnam policy. His wife, a Dade County official of the Republican Party, who specified her husband's official position, made the same request of Miami, Florida stations. On November 4, the Chairman of the Federal Communications Commission, in unprecedented calls to the presidents of the three broadcasting companies with national television networks, requested transcripts of the remarks of their reporters and others who had commented on the speech, saying there had been complaints, the source of which he failed to specify—although two weeks later on sober second thought, he seemed to reverse himself when he signed a letter adopted by the full Commission finding that the comments made on the networks after the speech in no way violated its doctrine of fairness. A special counsel to the President, Clark R. Mollenhoff, said that the speech "was developed by various White House aides," adding "if you are asking me, 'does it reflect the Administration's views,' the evidence is abundant that it does." The President's press secretary, Ronald Ziegler, agreed that a White House special assistant, Patrick J. Buchanan, "very well could have contributed some thoughts to the speech." Mr. Klein, on November 16, said, "I think that any time any industry—and I include newspapers very thoroughly in this, as well as the networks—if you look at the problems you have today and you fail to continue to examine them, you do invite the government to come in." In my judgment, the whole tone, the whole content and the whole pattern of this government intrusion into the substance and methods of the broadcast press, and indeed of all journalism, have the gravest implications. Because a Federally-licensed medium is involved, no more serious episode has occurred in government-press relationships since the dark days in the fumbling infancy of this republic when the ill-fated Alien and Sedition Acts forbade criticism of the government and its policies on pain of exile or imprisonment. In the context of this intimidation, self-serving disavowals of censorship, no matter how often repeated, are meaningless. Reprisals no less damaging to the media and no less dangerous to our fundamental freedoms than censorship are readily available to the government—economic, legal and psychological. Nor is their actual employment necessary to achieve their ends; to have them dangling like swords over the media can do harm even more irreparable than overt action. If these threats implicit in the developments of the past week are not openly recognized, unequivocally denounced and firmly resisted, freedom of communications in this country will suffer a setback that will not be limited to checking the freedom of television or to barring critical comment on government policy. It will precipitate an erosion that will inevitably destroy the most powerful safeguard of a free society—free, unhampered and unharassed news media. This does not have to be the resolute intention of any person or group, any party or government. We can wander unintentionally—all of us—into a lethal trap if we let our dissatisfaction with the handling of specific issues, which are variable, and of events, which are transitory, compromise our adherence to basic principles, which are constant. No permanent freedom was ever wisely exchanged for temporary popularity, for the popularity can be gone with changing political or social cycles and the freedom can be regained, if ever, only at fearful cost. And this is a truth that should be remembered by those who demand that our freedoms be preserved only when they agree with us, but who have been eager to restrict them whenever they disagree with us. You cannot side with restrictions or with bullying or with recriminations when they support your views and then oppose them when they differ, for they will rise up and haunt you long after your cause is lost or won. The issue here is simple. Dwight D. Eisenhower said, "I believe the United States is strong enough to expose to the world its differing viewpoints. . . ." His successor, John F. Kennedy, said, "The men who create power make an indispensable contribution to the nation's greatness, but the men who question power make a contribution just as indispensable." Criticism is an essential ingredient in that mix. It is central, not tangential, to a free society. It is always a free society's strength and often its salvation. Television itself is not and should not be immune to such criticism. As a matter of fact, it is the most criticized medium in the history of communications. Newspapers, magazines, academic groups, learned societies—who wouldn't dream of criticizing each other—criticize us every single day. Everyone has free access to what we do, and everyone sees us do it. We are not unaccountable. We are not clandestine. We have no end product that is not seen and judged by everyone. But such open criticism is a far cry from sharp reminders from high official quarters that we are licensed or that if we don't examine ourselves, we in common with other media "invite" the government to move in. The troubled pages of this country's history are writ dark with the death of liberty in those nations where the first fatal symptom of political decay was an effort to control the news media. Seldom has it been called censorship. Seldom is the word used except in denials. Always it has been "guidelines" in the name of national unity. And we might well ponder the fate of the unhappy roll of nations that had no regard for their freedoms or took them for granted or held them lightly. "Our democracy rests upon the assumption that, set free, the common man can manage his own fate; that errors will cancel each other by open discussion; that the interests of each when unguided from above, will not diverge too radically from the interests of all. . . ."
I appreciate having had this opportunity to speak to you today in what all thoughtful people must regard as a critical period in the life of a free society and of the free communications without which it cannot exist. 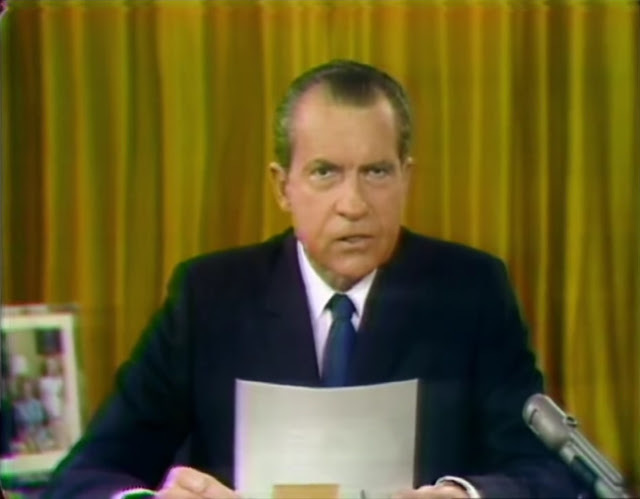 President Nixon's silent majority speech on the war in Vietnam was televised live on November 3, 1969. After the speech, the three major networks brought on their news correspondents to react. Frank Reynolds anchored the ABC News broadcast, which featured reporters Bob Clark, Bill Downs, Tom Jarriel, Bill Lawrence, John Scali, and Howard K. Smith. Former New York Governor Averell Harriman was also featured. Vice President Agnew slammed the coverage, singling out comments made by Lawrence and Downs. He also complained of Marvin Kalb's analysis on CBS News. The text below is adapted from here. FRANK REYNOLDS: The President has now concluded his speech. His second major speech of his Presidency, devoted to this single topic, the war in Vietnam. The President reviewed American involvement in the war and the efforts he has made since last January, his Inauguration, to bring the war to an end. As expected, Mr. Nixon rejected unilateral immediate withdrawal, and he reiterated his willingness to negotiate an end to the war. He fixed the blame for prolonging the war squarely with the North Vietnamese. None of this, of course, came as a surprise, but it must also be noted that the President, who said before the Moratorium on October 15 that he would not be influenced by it, has said just about the same thing tonight. There was in his speech no new initiative, no new proposal, no announcement of any more troop withdrawals and, in short, Mr. Nixon has taken a hard line, not only against the North Vietnamese but also against those in this country who oppose his policy. And he made an open appeal to the silent majority of Americans whom he no doubt feels are in the majority to support his policy. With us in our studio tonight to examine Mr. Nixon's speech, we have as our guest the Honorable W. Averell Harriman, former Governor of New York, former ambassador, former Assistant Secretary of State for Far Eastern Affairs and, of course, during the Johnson Administration our chief negotiator at the Paris peace talks. Ambassador Harriman will be interviewed a few moments from now by ABC State Department Correspondent John Scali. We shall also hear from our White House Correspondent Tom Jarriel, and I'll be joined in a discussion by my colleagues Bill Lawrence, our National Affairs Editor; Bob Clark, our Capitol Hill Correspondent; and Bill Downs, our Pentagon expert, all of whom will give us their views of anticipated reaction from their special areas. And I'll call on my colleague on the ABC Evening News, Howard K. Smith, for an analysis and comment. So, we'll have more, much more on President Nixon's speech to the nation tonight on the war in Vietnam right after this pause for station identification. Back in our studios in Washington, we propose to spend the next 25 minutes or so in a discussion of President Nixon's speech to the nation tonight on the war in Vietnam and his hope for bringing it to an early end. I want to call first on our White House Correspondent Tom Jarriel, who has tried to keep track of the President's preparation of his speech, and Tom, I'd like to ask you—we've all had a chance now, not only to hear the President's speech but to read it just before he went on—did Mr. Nixon hope to mute the voices of dissent in this country? Or was his primary goal, really, to rally the silent majority to his side? TOM JARRIEL: Frank, I don't think there's any question at all about it that his speech tonight was to the silent majority. He feels that these are the people who elected him and these are the people who, tonight, he was reporting to. And his remarks were directed certainly to them and not to those who are the so-called peace groups in the country, or those who are opposed to his Administration. Tonight, perhaps, he has given the silent majority in the country a brief history lesson in Vietnam, explaining how we got there. He has restated his determination to continue exactly where we are and firmed that determination up, and he projected a certain degree of optimism over it. He also feels tonight that he has perhaps better armed the silent majority with more information about Vietnam. Given them some moral leadership against the opposing forces in the country who are opposing his course in Vietnam. He has of course offered no quick solutions, pulled no rabbits from hats, and those who were looking for that certainly would be disappointed. The President tonight has perhaps polarized the attitude in the country more than it has been into groups who are either for him or who are against him. REYNOLDS: He's confident, no doubt, that those who are for him will perhaps not be quite so silent in the near future. Tom, why, since there was really nothing new, nothing substantively new in his speech, why the big buildup for it? Why were we told 21 days ago that this speech was going to be given at this time tonight? JARRIEL: It's certainly a very good question, and I still haven't seen the answer from the White House. They say that the President periodically wants to report to the people on the situation in Vietnam. They state that this speech was scheduled long before the October 15 Moratorium and it is a routinely scheduled affair, not having anything to do with tomorrow's [November 4] election. Certainly he did feel, I'm sure, that the time had come to restate his position, and we were warned repeatedly against speculation at the White House against going out on a limb saying that there might be massive troop withdrawals or perhaps a standstill ceasefire, and tonight after seeing the speech we certainly know why we were warned against speculation. REYNOLDS: The warnings against speculations, however, did not, I suggest, dampen the expectations of a great many people who did possibly anticipate something tonight. Thank you, Tom. One of the men most qualified, certainly the most qualified, to speculate on North Vietnam's reaction to the speech is Governor Harriman. For some nine months, of course, he was our chief negotiator in Paris, face to face with the North Vietnamese across the conference table. He is now here in Washington face to face with our State Department Correspondent John Scali. JOHN SCALI: Governor, could you tell us what is your immediate reaction to Mr. Nixon's address? AVERELL HARRIMAN: Well, John, I'm sure you know that I wouldn't be presumptuous to give a complete analysis of a carefully thought-out speech of the President of the United States. I'm sure he wants to end this war, and no one wishes him well more than I do. But since I'm here I've got to answer your questions. He approaches the subject quite differently from the manner in which I approached it. Let me first say, though, that I'm utterly opposed to these people that are talking about cutting and running; I'm against the Senator from New York's proposal—Senator Goodell—to get out our troops in a year, willy-nilly. I think we should have a responsible withdrawal. But my emphasis has been, and I think it should be, on winning the peaceful contest that will come after the fighting stops. The first thing we must do is to do everything we can to end the fighting, and I think that we could have made more progress in that direction. As far as winning the peaceful contest, we've got to look at who this government is—President Thieu. He is not representative of the people, in my opinion, from all that I've heard today. You've probably noticed that probably the most popular man in South Vietnam, General Big Minh, proposed that there be a national convention and consider the future. He didn't define what it should be but it should combine what I've been saying, all of the non-Communist groups. These are very small groups that are in the government. We've been talking to them for two years about expanding his base, and he's contracted it this last time he was there. There was nothing said in this speech about that, which to me, is the all important question. I don't think we can be successful in Vietnamizing the war, because I don't think they can carry the weight. People should consider that. We can reduce our forces, there's no doubt. We can take down a couple of hundred thousand troops, but we will have to leave probably for many years a very large force. If we attempt to reduce the fighting earnestly—reduce the fighting—we can possibly get the South Vietnamese to expand the base of their government and, to bring together, rally all of the non-Communist forces. 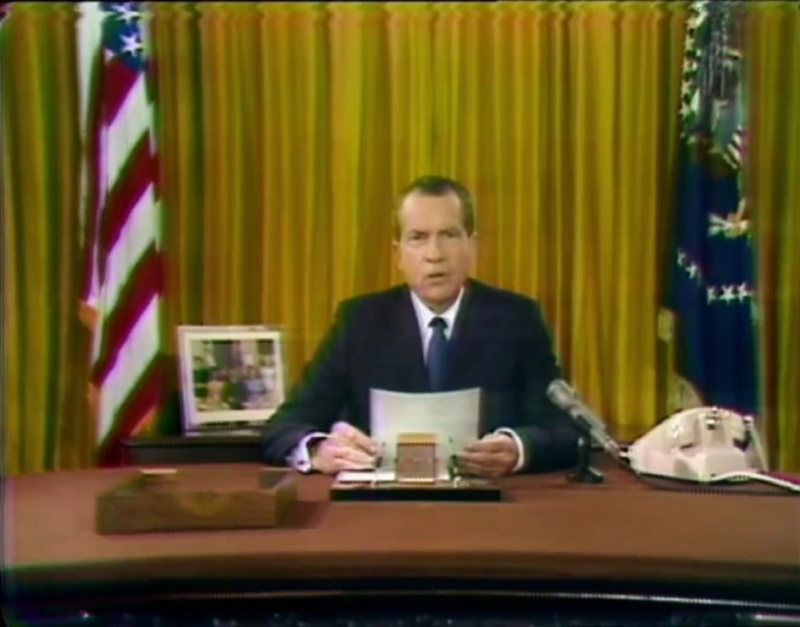 SCALI: President Nixon, Governor, says nothing at all about the advisability of some kind of ceasefire. Do you favor this as a step? HARRIMAN: Well, I've said that I thought that we ought to have taken up early in November—you know the trouble also was—something he leaves out—was that we expected President Thieu to have his representative in Paris on November 2. And then progress would have been made. The North Vietnamese had disengaged in the northern two provinces where the toughest fighting had been. Ninety percent of their troops were taken out. Half of those are gone; 200 miles north of the DMZ. And we never had a chance to talk about it. They have stated, of course, that the February and March offensives were counter-offensives to our pressures. Now whether that's true, whether it isn't, one can judge, but they did give us to understand that if we wanted to accept the status quo then that we could make progress. If we tried to improve our position militarily then there would be—go on and talk. Now even after this table question was settled, which I thought was a stall so as to—appeared to wait until President Nixon was in—maybe I was wrong. President Thieu said he wouldn't sit down privately. Now all these things have been left out, and I think they should be very carefully debated by the Congress. Particularly by the Foreign Relations Committee, and take a look at where we're going. SCALI: But you think one of the prompt steps should be to initiate a ceasefire—to propose a ceasefire? HARRIMAN: Working towards a ceasefire, right. If that is what the President proposes, I would certainly support it. SCALI: Do you agree, Mr. Ambassador, that there would be a blood bath in South Vietnam if the North Vietnamese were to take over? SCALI: But do you see a reign of terror there? HARRIMAN: Well, there might well be a reign of terror if there was a complete pullout. But there's no need for a ceasefire if we sit down with these people and try to work out the details. Now the President gives us some inkling that he's had private talks. I've found that the North Vietnamese representative is a very responsible man, a member of the Politburo. And I would have liked to have seen some talks with him. Exploring with him, before we make proposals what proposition they have to make to us. I think we could have gotten more out of that than our making formal proposals. Now these things—perhaps I'm wrong, but this is my first reaction: that we ought to give more thought to whom we're supporting, whom President Thieu represents, how much political influence he has in the country, and how we could win the political contest which is going to come after the fighting stops. SCALI: Governor, you've had a distinguished career as a politician here in the United States. You were Governor of New York. So I don't hesitate to ask you a question of this kind. Do you think that the silent majority in this United States will rally behind the President as a result of his speech? HARRIMAN: I don't know whether it's a silent majority or not, or silent minority, I just don't know. You can pick any poll you want; 67 percent was for the Goodell resolution, according to one poll. There's another poll that shows that 64 percent of the people want to see the government in Saigon changed. There are other polls which show that the President has the support of the people. I think he's got the full support of the people. He's certainly got my support in hoping that he will develop a program for peace. But I think that we've gone so far in Vietnam that this has to be discussed. It cannot be accepted without a lot more explanation, and it seems to me the Senate Foreign Relations Committee would be a very fine place for that discussion. SCALI: I gather, then, Governor, you were somewhat disappointed in the President's approach. HARRIMAN: Well, I wouldn't say I was disappointed. I was not surprised. This is about what I thought he would say from the position that he'd previously taken, and he's followed the advice of many people who believe this, many people who advised President Johnson, which wasn't successful, and I'm not sure that this advice will be successful in the future. HARRIMAN: There are so many things we'd like to know about this, but I want to end by saying I wish the President well. I hope he can lead us to peace. But this is not the whole story that we've heard tonight. SCALI: Governor Harriman, thank you very much. Frank? REYNOLDS: Thank you, Governor, and thank you, John. Now I want to turn to some of my colleagues who are here with me. Bill Lawrence, our National Affairs Editor; Bob Clark, our Capitol Hill Correspondent; and Pentagon Correspondent Bill Downs. Bill [Lawrence], it's your job to take the temperature of the country. Tell me, how's the country going to react to this speech? BILL LAWRENCE: Well, Frank, it is fair to talk about this politically because Mr. Nixon was out on the stump in New Jersey last week, inviting people to listen in. Politically I'm not sure why he did it because there was nothing new in it politically, and its impact will be on those who are moved by words if not by deeds. His appeal was not to the youth who've been raising trouble but rather to the silent majority, if they are a majority, who presumably have been with him all along. But there wasn't a thing new in this speech that would influence anybody to vote tomorrow or six months from now in a different way than his mood was set. Now the Democrats engaged in a little one-up-manship on this speech, after the White House announced it three weeks ago. They started very vigorously to build up hope about what this speech might contain in the way of some new move towards substantively ending the war sooner. They talked about a ceasefire, they talked about greater reductions in troops. Nothing happened. REYNOLDS: You think they were mousetrapping him? LAWRENCE: I think that was their purpose perhaps, and I think to that extent this speech certainly did not meet the expectations of those who turned on their television or radio sets and expected to learn some big new move in Vietnam, because it just wasn't there. REYNOLDS: Bob Clark, I have the impression that the ceasefire that's been observed on Capitol Hill of late might well be shattered as a result of the President's speech tonight, because he did not announce any major change in his policy. Do you agree? BOB CLARK: Well, I would be very much surprised if it didn't shatter resoundingly tomorrow, Frank. I think at the very least tonight too, the President passed a flaming torch to Senator Fulbright, who can be expected to go galloping off with it with new hearings on Vietnam before the Foreign Relations Committee. Those hearings, of course, were announced for last month and were postponed by Senator Fulbright to give the President a chance to make his speech tonight. Obviously now they will be rescheduled, and they are designed as specific hearings on specific proposals for bringing the war to an end and—on the Goodell proposal, among others—to get American troops out by a specified date. So it's very clear tonight that the gauntlet will be flung down to the President at those new hearings before the Foreign Relations Committee. REYNOLDS: Well, there seemed to be a note of—you might call it combativeness—in the President's speech tonight too. Calling on the silent majority to rally round the flag and stand with him. CLARK: Well, I think undoubtedly, Frank, that is true but there will be plenty of takers on the Hill and you'll hear them tomorrow morning. Not only from what we might call the militant doves, the ones who have been in the forefront for years with efforts to end the war, across the country. This cuts across party lines—many who have been moderates on the Vietnam war in the past who now feel more and more urgently about the need to set a termination date on the war. That, of course, is what the President failed tonight to do. REYNOLDS: Well, Bill Downs, you cover the Pentagon. What do you think the reaction there is? They probably are not too unhappy about this speech tonight. BILL DOWNS: No, I think that the Pentagon has come off pretty good. If there's been any wonder about the influence of Secretary of Defense Laird in the Administration and whether the State Department or Dr. Kissinger or who else is shaping the President's thoughts, why I think Mr. Laird comes out pretty well. I think the sort of key—from the Pentagon viewpoint—the key statement was that our defeat or humiliation in South Vietnam would provoke recklessness among the great powers who have not yet abandoned their goals of world conquest. Now, this is the Joint Chiefs of Staff's argument, the Pentagon line, if you will, that in a world of nations in a state of international anarchy, military power is the only answer to our security and to our freedom and the way we want to shape this world. It is not really the domino theory all over again, but it reminds me of what Dean Rusk used to talk about. The credibility of the American commitment. It must be honored. CLARK: This is strictly Rusk policy, the way I see it. McNamara policy. Although they won't like that on 1600 Pennsylvania Avenue. It does one thing, it allays any fears that people might have had around the world that the Nixon Administration might be heading us for a neutral or isolation course, but it's certainly not in this speech. REYNOLDS: Bill Lawrence, I want to put this to you. Mr. Nixon is an extremely skillful politician. I don't think there's any doubt about that. Do you believe that there is possibly a full appreciation in the White House now of the depth of the discontent in the country, or of the disenchantment with the war, the weariness, really, of the war? LAWRENCE: Well, Frank, I don't know whether understanding is the right word. I don't believe the White House believes that there is deep discontent. I'm not, you know, really sure, despite Mr. Nixon's victory for the Presidency last time, that he is so big a politician as you suggest. DOWNS: Bill, in fairness to the President, would you say that he said what he did tonight because there simply is no program that he would not regard as a cut-and-run program? That, then, is his basic dilemma? LAWRENCE: Yes, but in his campaign he said he had a plan that would end the war and win the peace. He said that again tonight. I still don't know where it is. LAWRENCE: The President . . . playing that game. REYNOLDS: Yes, and we must also recognize that this speech tonight is given just 10 days before another great big demonstration that will be all over this town, you know. Apparently Mr. Nixon has decided not to be influenced by that. It may well be that he feels there is more political advantage in giving the back of his hand to the demonstrators and standing up there as the embattled President holding firm against the onslaught of public opinion. CLARK: Frank, I would think that one immediate spinoff from the President's speech tonight is that you can now expect substantially more Congressional participation in that November 15 Moratorium. Many members of Congress who've been reluctant to involve themselves in what is shaping up as a more violent demonstration or a demonstration that may produce some serious violence will now feel obligated just to reply to the President. REYNOLDS: Well, thank you very much, gentlemen. History of course will give us, I suppose, the proper perspective with which to view Mr. Nixon's speech tonight. Earlier this evening on the ABC Evening News, Howard K. Smith referred to it as a battle. A battle for public opinion. Well, Howard, how do you think the President fought the battle tonight? HOWARD K. SMITH: Frank, you're talking about history. The most impressive thought that came to me from this speech was how much alike all Presidents who have had to deal with Vietnam have thought about it. I was looking through President Truman's memoirs today, and I ran across a prediction by him that if Indo-China, which Vietnam is part of, were to fall, other countries would soon follow, and therefore he was not willing to see it fall. Truman and Eisenhower, who disagreed on many things, joined together to sponsor a citizens' committee supporting President Johnson's intervention in Vietnam. And I recall a news conference in March, before his death, when President Kennedy was asked a question about it and he said if the Communists took South Vietnam their writ would soon run all the way to India and, who knows, perhaps all the way to the Middle East. So, he said, I can't agree to it. Up until now Mr. Nixon has not endorsed the action of his predecessor, and even tonight he disagreed with his tactics and the way it's been handled, but he did endorse the general goal of not yielding to the opposing side and seemed even unperturbed at the thought, which he mentioned himself, that people are now calling Johnson's war Nixon's war. I think for the first time I have a strong impression which I didn't have a couple of weeks ago when the senators who had criticized him had begun to support him. I for the first time have the impression he's not going to be hustled or yield to anything but a negotiated settlement involving free elections which probably the Communists couldn't win. I guess that by his speech tonight he's let himself in for some very rough handling in that next Moratorium demonstration that's coming. I would guess with Bob Clark that a topic grown dormant will now come aflame in Senator Fulbright's committee, and possibly on the floor of the Senate. He got his message across to the people he's counting on, called the silent majority. But what matters is whether he got his point across to Hanoi. That there will be no surrender in any guise and that they will have to negotiate. And as has been so often said tonight, we'll just have to wait and see. REYNOLDS: Thank you, Howard, and thank you all, gentlemen. The President said tonight—I think perhaps this certainly expresses his view with respect to the Moratorium upcoming and the past demonstrations—if a vocal minority, however fervent its cause, prevails over reason and the will of the majority, this nation has no future as a free society. That apparently is the guide that is going to guide the President as he tries to end this war and also deal with the dissent at home. This is Frank Reynolds in Washington. Good night. This text is adapted from a transcript of the CBS News broadcast which aired following President Nixon's address to the nation on November 3, 1969. It features Dan Rather, Marvin Kalb, and Eric Sevareid. Later, Vice President Agnew would single out Kalb's analysis as well as commentary by Bill Downs and Bill Lawrence on ABC News, dismissing it as "instant analysis and querulous criticism." President Nixon said he has adopted a plan for withdrawing all United States ground troops from Vietnam; however, he said he would not, could not, commit himself to a fixed timetable for troop reductions. President Nixon said his secret plan for complete withdrawal has been worked out in conjunction with the Saigon government. He made no mention of any further troop withdrawals after the current pull-out of 60,000 men by December 15. He flatly rejected demands that he should end the war at once by ordering an immediate and complete withdrawal. The President listed several heretofore secret attempts at peace. He said he had tried, since being elected President, including one personal letter to Ho Chi Minh, a letter which President Nixon said was answered only three days before Ho's death, and the answer was, in the President’s opinion, discouraging. Those are the highlights. Next, an effort to put those highlights in perspective. A brief CBS News examination of the President's speech. With me in our CBS studios are my colleagues CBS Diplomatic Correspondent Marvin Kalb and our National Correspondent Eric Sevareid. Marvin Kalb, in your judgment, and let's preface this by saying, as always, this is a difficult bit of guess-work to immediately follow a Presidential address—what in your judgment is going to be the reaction in this country to the President's speech and, after dealing with that, then overseas? MARVIN KALB: Well, first, Dan, I'm not sure, but it seemed to me first that the speech cut no new ground. It seemed a soft-spoken straight-in-the-eye restatement of policy that clearly is not aimed at that group of Americans dubbed by Vice President Agnew as "an effete corps of impudent snobs." Rather it was aimed, as the President put it, at you, the great silent majority of my fellow Americans. Presumably those who do not demonstrate; those who want an honorable end to the war but have difficulty defining what an honorable end is and are willing to trust the President to get it. Those who are not so willing will point to the absence of a new announcement on troop withdrawals or a definite timetable for the total withdrawal of U.S. forces and they may disagree with the President's judgment that the Ho Chi Minh letter was a flat rejection of his own letter. The Ho Chi Minh letter contained, it seems, some of the softest, most accommodating language found in a Communist document concerning the war in Vietnam in recent years. The President's policy is best summed up in one of his phrases—a negotiated settlement, presumably in Paris, if possible; Vietnamization if necessary. Tonight a White House source issued what seemed like a veiled threat to change the character of the Paris talks, perhaps even to break them up, if the Communists, he said, continue to refuse to negotiate seriously. RATHER: Eric Sevareid, this speech was widely anticipated to be something of a watershed for the Nixon Administration. What is your gut reaction to it? ERIC SEVAREID: Well, Dan, this, it seems to me, is an appeal to the American people for unity and for support of their President, done in a low-keyed but very fervent manner. As you've said, or Marvin said, nothing of a substantial nature or dramatic nature that is new; he is standing his ground; he is offering no ceasefire, no public fixed timetable for withdrawal, no announcement of a new contingent of troop withdrawals. He is asking for trust to let him have flexibility and a free hand. I would think that on its face this speech would not draw the fangs of some of the leading critics, particularly here in the capital, some like Senator Fulbright and others, who were ready, if there was something given them of a definite nature in this speech, to cease their criticism and to support the President. I would doubt now that they would do anything but keep on with the attack. It may give a little more strength to that demonstration scheduled for the middle of the month. But I can't escape the feeling—and it's only a feeling—that this is not all we're going to get this fall. That there may well be an announcement of a quite sizable troop withdrawal and fairly soon, possibly before these mid-November demonstrations. I have no evidence for this at all except the feeling that it cannot rest where he has left it. that he does have more time. And I would think that if there is to be another announcement of a troop withdrawal with numbers, that that may tell us a good deal more about the time scale in which he is thinking, the magnitudes of his thought about winding down the war. Philosophically, where this war is concerned he doesn't seem to be any different from Mr. Johnson or Secretary Rusk. He adopts the notion that on a worldwide basis freedom is indivisible, the notion that an American pullout would collapse confidence in American leadership all over the world. It's the test-case idea that failure there would set Communists into action in many other areas, even in the Western Hemisphere, he says. This, of course, is hotly debated by philosophers of foreign policy, and has been for a long time. And one would think if all that were true, if this war and our presence there was of this cosmic and universal importance then the war should be won. But he has said it is not to be—a military victory is not to be sought. And in that, it seems to me, there lies a profound illogic; that it's over the dam, he is trying to get us out. RATHER: Eric, in your judgment is the President going to win this gamble that he can hold a majority of American public opinion behind him for this policy of winding down the war slowly, deliberately, orderly, and, as he sees it, honorably? SEVAREID: I personally hope he can. I don't know that he can. I think this speech would have been effective last spring, but it's late in the day; and this is why I think something else is going to come and very soon. I do not believe it can rest here. But this is only my horseback opinion of one man. And I could be wrong. RATHER: Marvin Kalb, a horseback opinion of one man on what the effect is going to be on the North Vietnamese and the Viet Cong? KALB: Well, it seems to me that what they could say, and they may not be too far off base in this kind of judgment, is that the President has not given them anything terribly new to chew on; but I don't really feel that the President was talking to them. As he pointed out, he was talking very much to the great, silent majority of the American people, and the North Vietnamese haven't been given anything, really, in this speech to chew on, not at all. It seems to me, if anything, it's going to be somewhat negative in terms of the President's judgment of the Ho Chi Minh letter. Ho Chi Minh is now dead; he is a god in North Vietnam at least, and certainly has good deal of strength elsewhere in the Communist world. The President defines this [Ho's letter] as a flat rejection, and yet you have a number of statements in here which suggest considerable flexibility in negotiating posture. This may not yet be apparent in Paris, but it certainly is there in the language of this Ho Chi Minh letter. RATHER: Gentlemen, we're running short on time, but very briefly, do you see this speech as an indication that President Nixon and those around him still feel that the war is winnable in the sense that we can keep from losing? Do you agree, Eric? SEVAREID: Yes, I think that's what he's trying to do, to keep from an outright open humiliating loss. KALB: Very much. I agree with that completely. He apparently feels the great effect that this might have on domestic life in this country; and he fears that almost as much as he does the implications abroad. RATHER: It may be, then, that the pertinent section of this speech was when the President said: "Let us understand North Vietnam cannot humiliate or defeat the United States, only Americans can do that." Gentlemen, thank you very much. Good night. 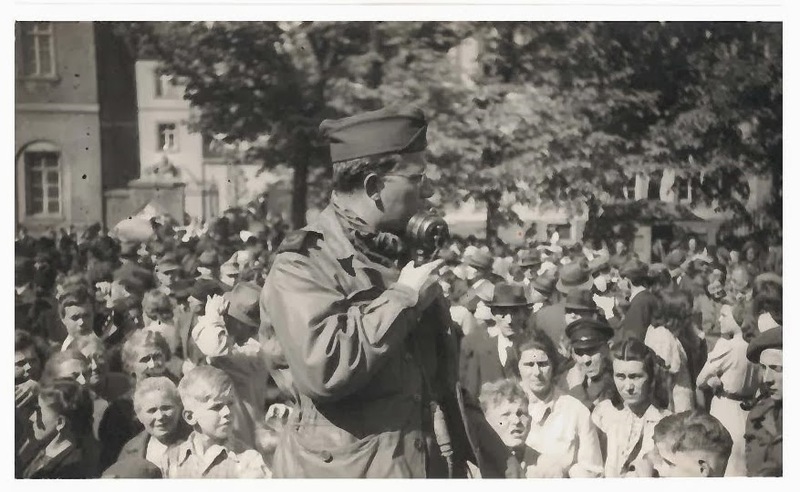 Bill Downs sent out these dispatches from the Western Front in 1944 and 1945. The accounts are from the 1946 collection BBC War Report: A Record of Dispatches Broadcast by the BBC's War Correspondents With the Allied Expeditionary Force, 6 June 1944 - 5 May 1945. 10 and 11 July 1944. "Caen has suffered terrible things in this last month, yet the reception which its citizens have given to us has been moving in the extreme. Not a word of reproach; not a word of self-pity. This morning the war was still very near at hand. German aircraft kept appearing overhead: German airburst shells were exploding just above the roofs; occasional mortar shells were bursting in the streets. Yet the people of Caen were out, picking their way through the rubble, smiling at us, waving to us, embracing us, giving us flowers, and time and time again I saw it—weeping for sheer joy. There is no hysterical demonstration: the feelings of these people were far too deep for that; but there was a tremendous conviction and sincerity in their welcome. "In a small courtyard outside a church the people were already preparing for a ceremony and the raising of the Tricolour over the liberated country. The ridged French Army helmets appeared from nowhere. One man even had on a creased uniform of the regular army. It was rumpled from long hiding in the closet. And every other person wore the Cross of Lorraine. But strangest sight of all was that the men wearing helmets also carried arms. 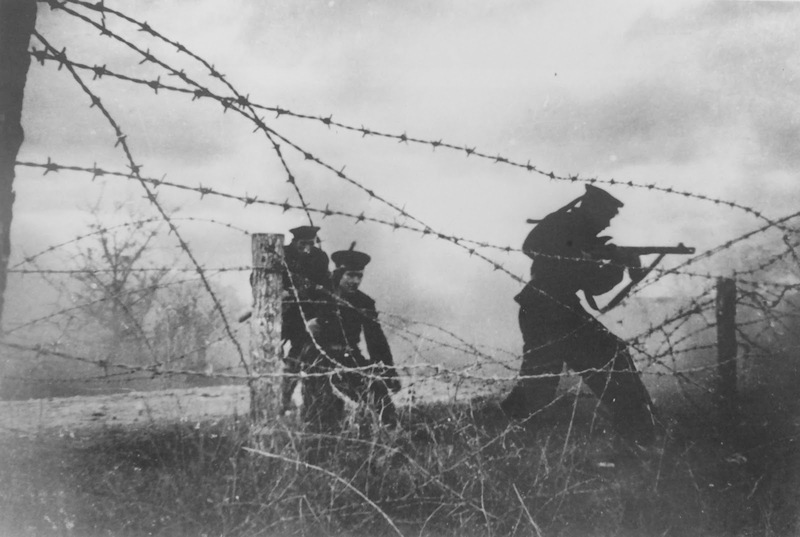 Some had the long rifles of the French Army; some had German rifles; one or two even had some British Sten guns which they had bargained from the liberating troops. They were ready to resume the war where it left off in 1940. Most of them were in tattered civilian clothing, but they weren't waiting to be dressed up to fight the Boche. And this motley group of soldiers representing the resurrection of Fighting France formed a proud colour-guard for the French Flag, virtually under the muzzles of the German guns. British, Canadian, and American officials appeared. They were the military and civilian authorities come in to administer the city. A squad of British soldiers snapped to attention. Everyone in the crowd took off their hats; the mayor of the town, wearing a French helmet and a badge bearing the Cross of Lorraine, gave the command and the Tricolour was raised. It was quiet for a moment for there was not even a sound of gunfire; then the people began to applaud and shout again and again: Vive la France!" 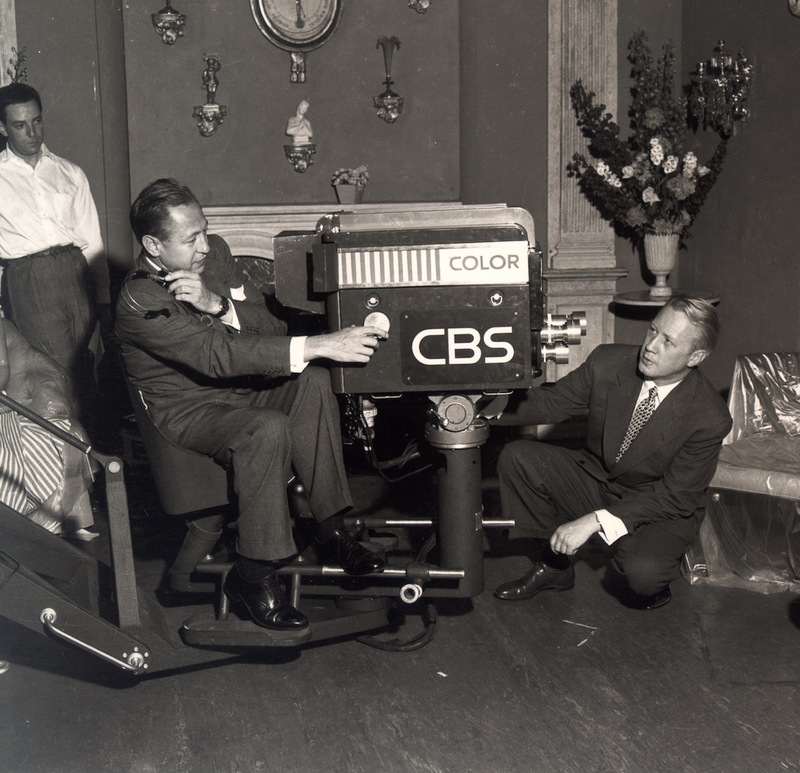 FRANK GILLARD, BBC and BILL DOWNS, C.B.S. "At this moment Field-Marshal Rommel is a victim of the old army game—a game in which the Allied forces in Normandy have again called the tune. 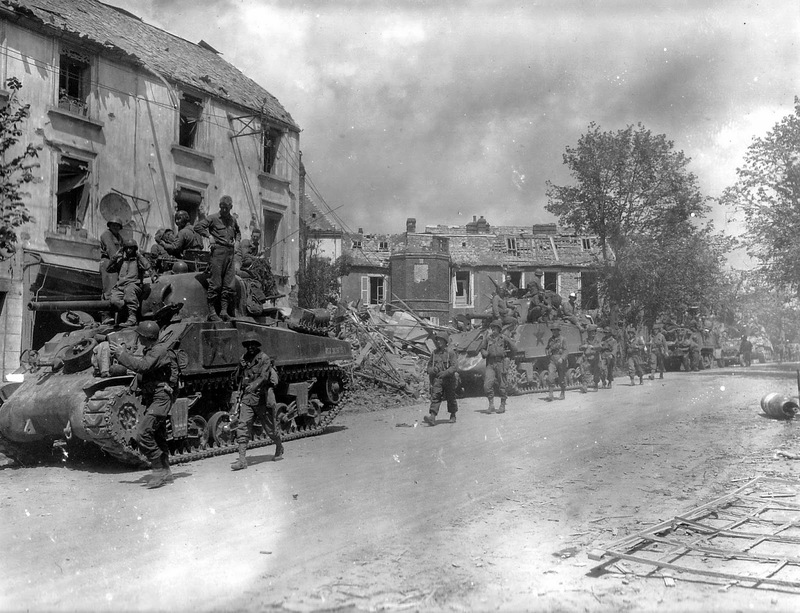 The American break-through on the western sector of their Normandy front has completed a series of bluffs and counter-bluffs made by the Allied Command, and is now finding its pay-off by the successes of the U.S. Army forces south of the Cherbourg peninsula. The way the Allies have played this game is an interesting study of military strategy. After the fall of Cherbourg the German Command deduced incorrectly that there would be a lot of consolidation and regroupment on the American sector before there could be any further action there. So Rommel concluded that the next move would be an attack on the British sector to the east. He obviously figured that the next Allied move would be a drive for Paris. So he committed some seven divisions around the British and Canadian sector, leaving less concentrated forces more thinly spread along the line of the American sector. When this became clear, the Allies decided that the German Command should go on thinking like this. So the British and Canadians staged a series of sharp, heavy attacks between Caen and Tilly that gained the British bridge-head across the River Odon. 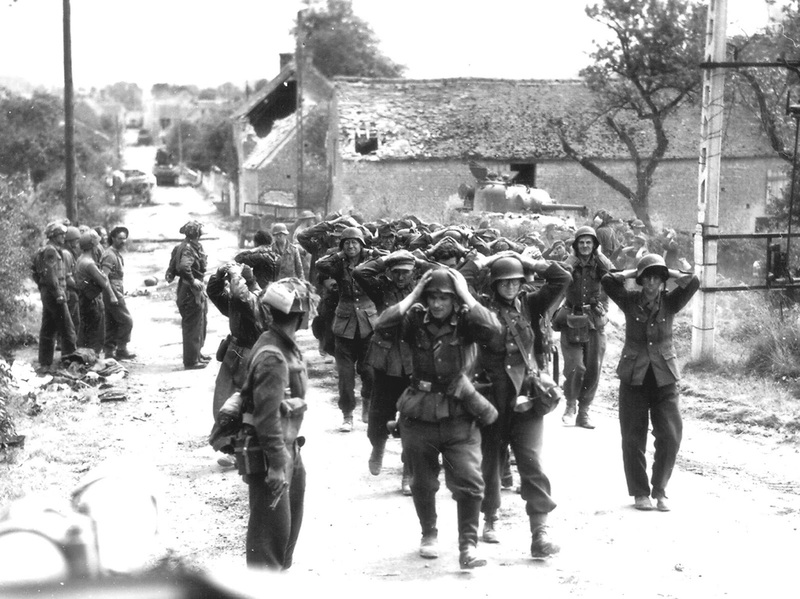 This was followed by the attack on Caen itself, which resulted in the capture of the northern half of the town. And then there was the big air blitz down the eastern side of the Orne River, which ended in the complete capture of Caen, and the establishment of a comfortable bridge-head around the city. "By the time these attacks had finished, more German forces were concentrated on this eastern sector. Then General Bradley made his big move five days ago. And now Rommel is in the position of a poker player who has put so much money into the pot that he cannot afford to drop out of the game. And he has to play it the way the Allied Command wants it to be played." "For example, the other day a British armoured unit was ordered to occupy a wood. It so happened that the Americans also were told to occupy a wood. Over one of the British tank's radios the headquarters asked the British tank commander what he had found in the wood. 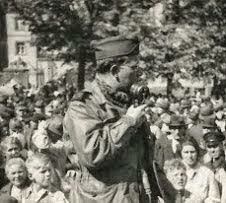 'Millions of Americans,' the tank commander replied. Headquarters then said, 'We have learned that German tanks also have been ordered to occupy that wood.' The British commander was silent for a minute, and then said, 'Sorry, there won't be any room here for them!'" "I watched the tons of bombs plunge into their targets last night; strange flashes lit the sky, the effect was weird and terrible, with a three-quarter moon rising over the Orne Valley shining blood red through the haze, and the dust, and the smoke. The concussion of the bombs pressed my clothing against my body, even though I was several miles away, and the ground trembled under my feet. It is a difficult operation, this fighting in the dark; units get confused, lost, and mixed up, so there were other special methods devised to guide the infantry and the heavy tanks forward in the dark. The infantry were given heavy armoured carriers which had been specially converted for them so they could ride forward with the first wave of tanks. These carriers gave them maximum protection against light enemy fire, and against shell and mortar bursts. To guide the ground forces forward the Canadians employed the old trick which the British used at the Battle of Alamein: lines of tracer bullets were shot over their heads, stretching out like rows of electric light bulbs sailing slowly in the air. The tanks and the infantry and their armoured carriers moved forward while the bombing was still on, the lines of tracer bullets (there were more than half a dozen columns of them) floated over the battlefield looking like a roman candle display, and all around hundreds of guns seemed to grab the atmosphere and shake it, and bounce it, and tear it to shreds." "You have to move a little faster, the convoys are more crowded, and you spend a lot more time looking at the back end of the truck ahead of you, and you don't spend more than a night or two in the same slit trench—you move forward all the time. You eat a lot of cold rations because you're on the move and when you bump into the enemy rearguard the fighting is just as bitter as it was before. And when you take the Nazi-held position you find that there haven't been many Germans because the enemy has retreated, and there isn't much booty and not many prisoners—yet. But there are mines, hundreds of them. They lie in the roads, and sometimes there is a string of six of them down a road. You set one off and the whole road goes up for ten yards ahead and behind you. And there are plenty of the S mines—the nasty anti-personnel type that jumps into the air before it explodes and then hurls bits of steel and ball bearings to kill or wound anything living within a hundred feet radius. You have to be mighty careful where you step. And then there are the booby-traps. Maybe you see a bottle of wine lying beside a bombed building, but you don't touch it. And maybe there is a tempting apple-tree beside the road—the apples are just getting big enough to eat, but you leave that tree alone too because it might blow up in your face if you pulled a branch down. There are plenty of snipers, but you've learned to pay not much attention to them anymore, for if someone gets it from a sniper a detachment is sent out to clean him out and the advance continues. "This might be the big retreat of the defeated German Seventh Army, but it's still just war to the man with the job of pushing the Nazis back. And the German kills just as effectively when he retreats as when he advances." "You jeep and jeep until you feel your kidneys are jarred loose from their brackets and you pass through one undamaged village after another, punctuated occasionally by a complete mess of a town that happened to be a railroad junction, or which was unfortunate enough to offer resistance to our advance. Then, as you get closer to the front, you notice the soldiers sitting cheerfully in the convoys, or a lot of horseplay in the fields, for everyone is in high spirits these days. You pass the convoys and the tanks and the guns, and you keep a weather eye out for headquarters. But somehow you miss it; but you keep on driving anyway. Occasionally in the distance your own artillery may let loose a barrage to remind you that there is still fighting ahead. But no one pays attention, including the civilians of this particularly unspoiled bit of Germany. The people smile, and sometimes wave, and the girls mostly just smile. It's hard not to pay any attention to that—ask any soldier. "You drive on, stopped occasionally by a road jam. It's April, and the spring showers seem to dampen no one's spirits. Then you drive over a hill a mile or so from Osnabrück. More serious-looking soldiers are sitting on tanks, with bayoneted rifles. The sun happens to be shining, and you see one of them asleep. Suddenly, from beyond an ineffective German road-block not fifty feet away, an unholy splutter of machine-gun fire gushes out towards a factory building sitting in the valley. Then the tanks' heavy gun barks with a ferocity that echoes through the forest. Then it's quiet, and you wait for the enemy's return fire. But there is none. 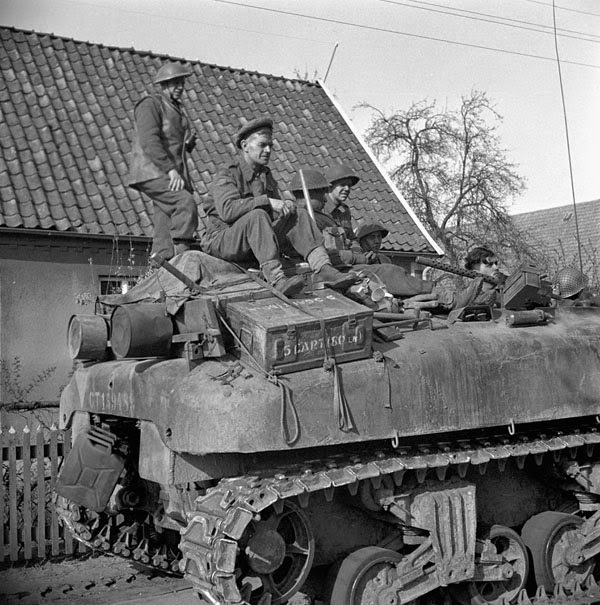 "A British paratrooper lieutenant walks up to the tank with his men sitting atop it. He yawns, and stretches. 'You chaps get ready,' he says, 'We'll be moving up pretty soon.' But he did say it with an air of a man with spring fever, who didn't care when, if ever. As I left, the column started rolling into the town. "Apparently the British do this sort of thing with that careless unconcerned air all the time." "We drove down an empty road, uncomfortably empty, with no sign of anyone on it. We reached the crossroads, when suddenly out of the woods appeared eight Germans; it was a frightening sight, particularly when I remembered that the only gun we had was the driver's Sten gun, and it was buried under our raincoats, and the bullet clip was somewhere in a corner of the jeep. However, these were very tame Germans, they all had their hands up. We stopped, searched them, and rigged up a white flag for them and told them to march on down the road and somebody would pick them up. That took care of the first eight. "About that time, another young American flyer rode by on a motorcycle. He also was an ex-prisoner getting himself some food and fresh air for the first time in months. 'There's a town down the road that's just begging to be taken, why don't you go down and have a look?' Then about that time he spotted a chicken running across the road and that was the last we saw of him. "We took two British boys back to the camp; there I told the story of two BBC engineers who had been with me making recordings at the camps. They were all for taking the town. Again there was kilometre after kilometre of distressingly empty road, but it seemed like a good day for conquering and no one worried particularly. Finally we reached the cross-roads village of Hohne just west of the town of Burgen. I knew the traditional way to capture a place and maybe stick a sword in the ground, and proclaim the place was ours, but I had no sword, and besides, it was a beautifully hard road, and no sword would stick in it anyway. But Sergeant Tinker knew what to do—he went in search of eggs—fresh eggs, and meanwhile, Sergeant Arthur got interested in the farm across the road. There was a big German Army car—with a white flag flying from it. We went into this farmyard to find out what it was all about and to our surprise up stepped one of the most magnificent German officers I've ever seen, complete with Iron Cross and a number of other decorations. My first-year college German was still intact enough to understand that he wanted to surrender—he had his belongings all packed including a pair of ski shoes—what he wanted with ski shoes I was never able to find out. He turned over his pistol and said that we could drive him back to captivity in his own car. Then the German colonel said that he'd like very much if we would take his entire battery prisoner. He was the commander of a battery of 88-mm. combination anti-tank and anti-aircraft guns. We decided against capturing the gun battery for we were not sure that a battery of 88's would appreciate being captured by just one Sten gun, no matter what the colonel said, but we took the colonel up on his offer to use his car. Sergeant Arthur drove the car—Sergeant Tinker reappeared with a cap full of eggs. The colonel climbed in and we made up a convoy—my jeep in front—the colonel's car in the middle with two sergeants, and the BBC truck with the two unarmed engineers bringing up the rear."